So I stop into the McKnight Road Giant Eagle (Jant Iggle if you are from Pittsburgh). This is the sign just above the “customer service” desk – ya know, where the customers are supposed to get “service.” Unfortunately, by the looks of the sign, there are too many services. Unfortunately, by the looks of the line I was in and the ONE, very nice, senior citizen lady working the “customer service” desk my hypothesis is proven correct!!! They offer waaaaaaaaaaaay too many services – EZ Pass, Gift Cards, Bus Pass, Wire Transfers. What’s missing from the list – TIMELY SERVICE! I’m thinking I am going to write my State Rep and ask that a bill get passed regarding the ratio of extra-service-workers in relationship to the number of extra services offered at grocery stores. Seems important to me! MAYBE I CAN EVEN GET ON THE NEWS!!!! We can pass a rider on the bill stating that Bank Tellers are not allowed to go to lunch at lunch time, WHEN I AM AT LUNCH TRYING TO USE THE BANK! So Giant Eagle, according to the Pittsburgh Business Times book of lists, you’re one of the largest employers in the area. How about 3 more employees at the McKnight Road location!!! If I wanted to spend THAT much time in your store I would submit a resume. 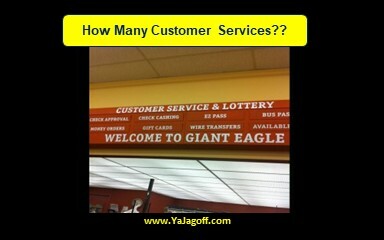 If yer gonna offer that many services, how about a few staff members to PROVIDE THEM, Ya Jagoffs!!! Previous article#YaJagoffPodcast / Picklesburgh: A Big ‘Dill’ for Jagoffs! PAT’s Union Leader, Pat, A Sneaky Little Cat!